As we reported in our November newsletter, CIR began working with the U.S. Navy and Tetra Tech, Inc. to restore a portion of the Mugu Lagoon. In the time since then, we have installed over 5,000 native plants, all of which were grown in our native plant nursery in Camarillo. The most common plants we installed were Parish's glasswort (Arthrocnemum subterminale) and marsh jaumea (Jaumea carnosa), though arguably one of the most important plants was Eriogonum parvifolium or 'seaside buckwheat,' the host for the rare and endangered El Segundo blue butterfly, which can be found on the Point Mugu base. This little butterfly spends its entire life cycle around this particular buckwheat. Overall, the plants we have installed are helping to reestablish a very threatened wetland habitat, which gives home to many rare and common species of plants, animals, and insects. Many thanks to the hundreds of volunteers that dedicated their time to make this happen! Additionally, a huge thank you to all of the volunteers that gave their time to the Camarillo Nursery! Plants raised in the nursery have not only been used in the restoration of the Mugu Lagoon, but also the San Marcos Foothills Preserve and the Burton Mesa Ecological Reserve. CIR is excited to announce a new project with the U.S. Navy, this time it will be on the mainland! 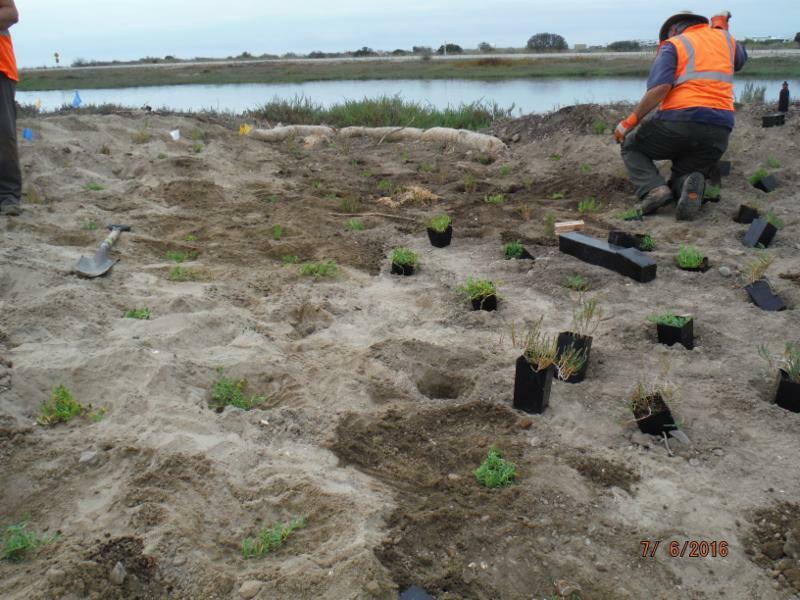 CIR is currently growing plants for a restoration project at Point Mugu Naval Air Station. We will install up to 5,000 native plants in buffer areas between roads and wetlands. This will provide habitat for native animals and will provide soil stabilization, which will help protect the wetlands from erosion. CIR will work in partnership with Naval Base Ventura County and Tetra Tech, Inc. on this project. The plants will come from seed collected at the Mugu Lagoon, and most will be grown at the new CIR nursery in Camarillo. This is the third project CIR has with the U.S. Navy, the other two being our restoration work on San Nicolas Island and our invasive plant removal projects on San Clemente Island. Volunteers will have many opportunities to participate in this project, including helping grow the plants over the next several months and installing them in the spring. installed at Point Mugu in 2016. Mugu Lagoon is Ventura County’s largest wetland and wildlife sanctuary and provides habitat for more than 250 bird species, as well as many species of migratory birds. The lagoon is also one of the few breeding grounds in the county for harbor seals and other pinnipeds. Stewardship of the lagoon is a high priority for the U.S. Navy, who has protected the area for nearly 70 years. Many rare wetland species are found at the Mugu wetlands, and many plant species reach their northern or southern limits at the Lagoon. Access to the base is extremely restricted, and this project will present a special opportunity for volunteers to visit the area, which is closed to the general public. In fact, CIR will need to apply for navy passes for participants to gain access onto the base and the restoration site. However, no passes are needed to help us grow the plants at our new Camarillo nursery! CIR is grateful to our partners in the Navy and at Tetra Tech for this opportunity to help restore the Mugu Lagoon ecosystem. with our partners and our volunteers!